Once believed to be the entrance to an undersea passage between Europe and Africa, St. Michael's Cave today hosts concerts, ballets, and other cultural events in its large auditorium. A recently discovered Neolithic bowl proved that the cave was once occupied by prehistoric humans, long before its rediscovery in ancient Roman times. For centuries it was thought to be bottomless, which spawned various legends--such as the one connecting it to the gates of the underworld. At the far end of the main hall, look for the huge stalagmite that fell off the ceiling thousands of years ago. The cross-section revealing its interior structure will show you the natural history of the cave on a miniature scale. 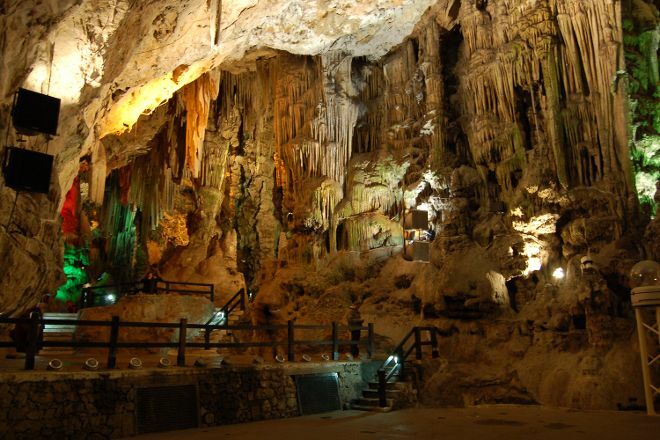 To visit St. Michael's Cave on your holiday in Gibraltar, and find out what else Gibraltar has to offer, use our Gibraltar tour itinerary builder app . It's an awesome experience being deep within a massive cave with stalactites and stalagmites and seeing occasional drips of water fall onto the damp floor, and maybe the odd one on yourself! Adding to the natural splendor are beautiful floodlights changing colors as you walk around with the help of stairs and handrails where necessary. To top it of, very cool music blasts through a very fine sound system. You can't visit Gibraltar and not go up the rock to see this! This was one of my favorite places we visited in Gibraltar. I have been to other caves before, but this place has so much additional history. Hearing the stories about how the locals were forced to create additional tunnels as an escape route in the event that the Nazis invaded gave me chills. This place was truly unique. If I'm ever fortunate to visit Gibraltar in the future, I will contact the Department of Tourism to arrange a visit to see the underground lake. It cannot be scheduled through just any guided tour. Every day, we help thousands of travelers plan great vacations. Here are some tips on how to use your Listing Page to attract more travelers to your business - St. Michael's Cave. Promote your permanent link - https://www.inspirock.com/gibraltar/st-michaels-cave-a98832189 - on your website, your blog, and social media. When a traveler builds a plan from this page, the itinerary automatically includes St. Michael's Cave. This is a great way for travelers looking for a great vacation in your city or country to also experience St. Michael's Cave. Promoting your link also lets your audience know that you are featured on a rapidly growing travel site. In addition, the more this page is used, the more we will promote St. Michael's Cave to other Inspirock users. For best results, use the customized Trip Planning Widget for St. Michael's Cave on your website. It has all the advantages mentioned above, plus users to your site can conveniently access it directly on your site. Visitors to your site will appreciate you offering them help with planning their vacation. Setting this up takes just a few minutes - Click here for instructions.